Beauty of Singapore is that there is a different culture and story awaiting you at the very next bend! Your tour starts from Singapore River and hear about Singapore's Trading Heritage in the late 60's and how gangsters once called the shots on this very stretch. After that, we will journey down to China Town and visit the beautiful architecture left behind from our colonial times. Visit the Chinatown Wet Market, Sri Mariamman Temple and Tian Hock Chinese Temple. 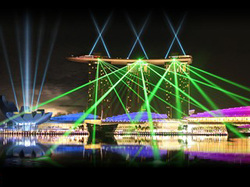 When darkness falls and the city lights lit up, get ready to be awed by the beautiful city lights of Singapore. Start off from the Singapore Flyer as we take the route towards the Singapore River. Take in the night life of Singapore, as Pubs and Bars starts coming alive! As we proceed down towards Fort Canning Park, prepare yourself as we take a night trail through the Fort Gate sharing it's role during the World War 2. Next, journey towards Gardens by The Bay as we explore the magical gardens during the night and visit our special sight to see Singapore from a different view. Finally, our Night Cycling Tour will come to an end as we end off at the The Singapore Promenade to catch the Wonder Full Light Show, Southeast Asia's largest light and water show!